This mokkai falls under the category 'mathematical mokkai' and happened in a classroom. Is he the Yellai kaatha maaveeran? 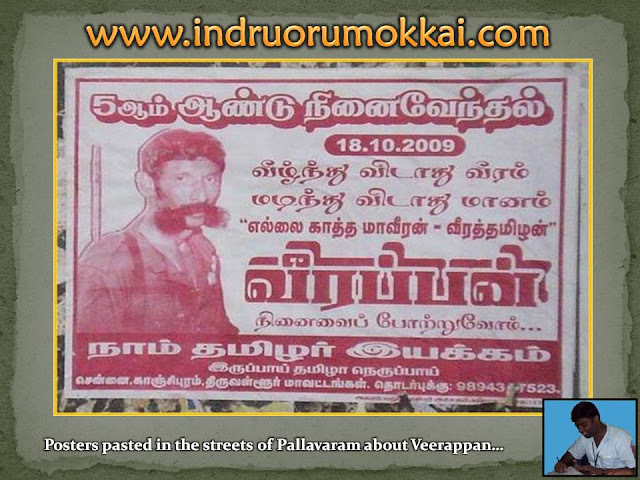 Veerath Tamilan? What is the difference between Men’s and Women’s Haircut? Woman 1: Oh! Why are you cutting the hair? That's so lengthy and cute! Woman 2: Really! Is it so? Give me the mirror! Isn’t look too fluffy? Woman 1: No pa, it's good and perfect. I wish to have my hair like that, but for my wide face it’ll not look good! Woman 2: No! No! Your face is not wide; it’s adorable. You can easily get those layer cuts. For you that would look very much cute. I thought of going to do those layer cuts. But, I was worried it would accent my neck. It’s long! Woman 1: Cha… Cha… I wish to have neck like that of yours! But, my shoulders will not match for this long neck! 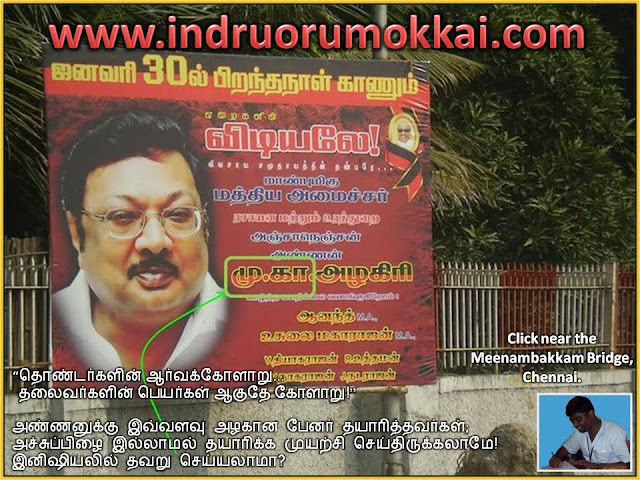 The above photo of the banner put for our Honorable Central Minister Mr. Alagiri near Chennai Meenambakkam bridge with mistake in the initial of him! 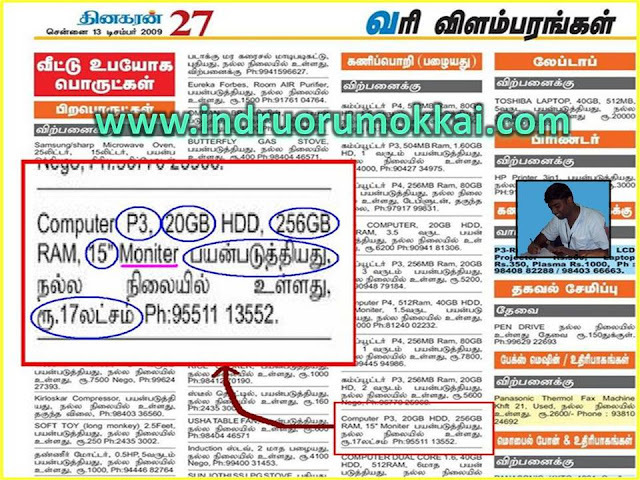 But, 256'GB' RAM - this is the first time I am hearing about that... Athanaala than intha price-a? 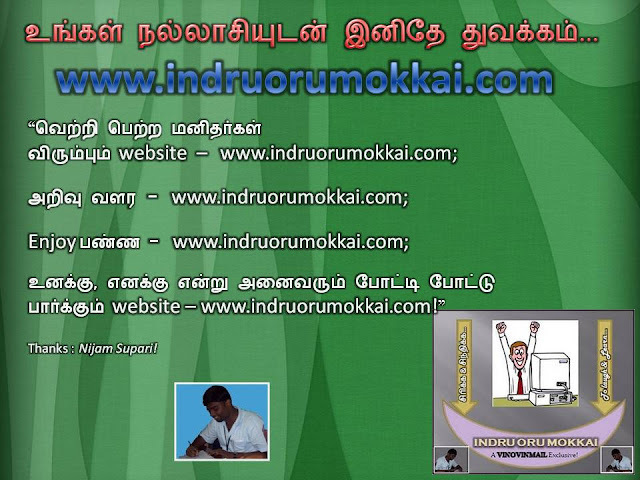 When everyone is thinking about blogging, what is a blog and how to blog, we started this Website (Indru Oru Mokkai) for mokkai successfully. This Website is for mokkai, mokkai and only mokkai! It's all because of you - the visitors. Spend atleast 2 minutes on this blog daily and be relaxed! Expected your comments for every article. Share this blog with your friends and promote! 1) Several women living in an apartment, accusing the next flat women for a trouble in the flat where they lived filed many cases in the court. Since, all the complaints are registered on the same day, the judge wanted to hear the oldest first and follow in decreasing order. But, the case was closed. The reason for the closure is lack of evidence since no body accepts that they are older! But, she wanted to drive the car few blocks from the house. 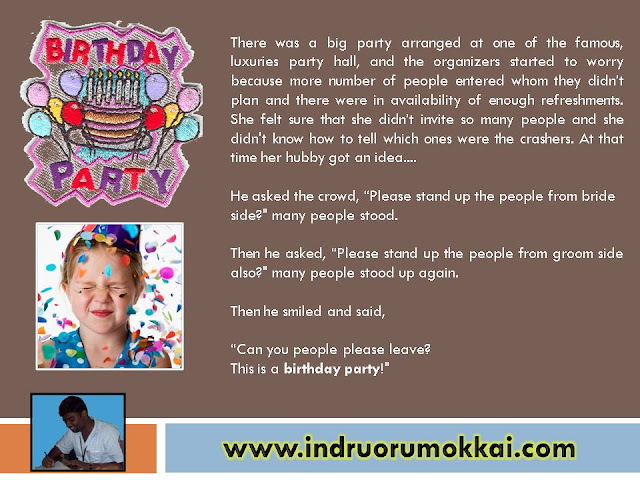 After various tortures, he finally cautioned her, "Keep this in mind! If you have an accident, then tomorrow your age will be printed in the newspaper!" Then, the wife didn’t touch the car at all! 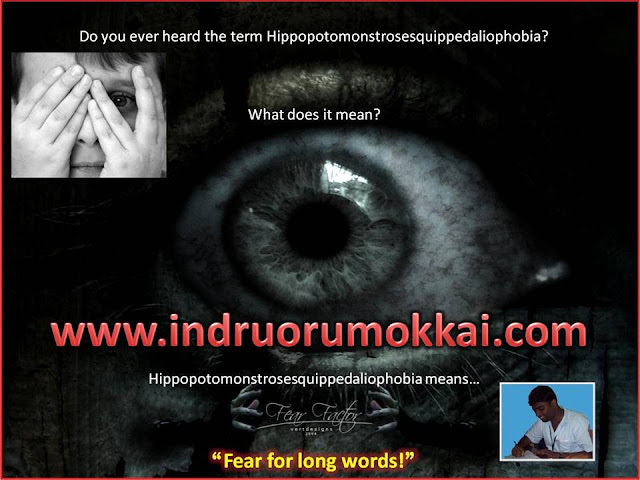 This is one of the scraps received by my one of the GFs in Orkut. 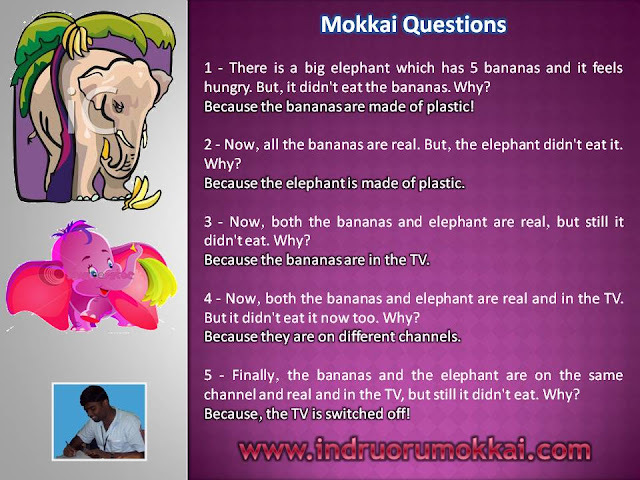 How is the mokkai? 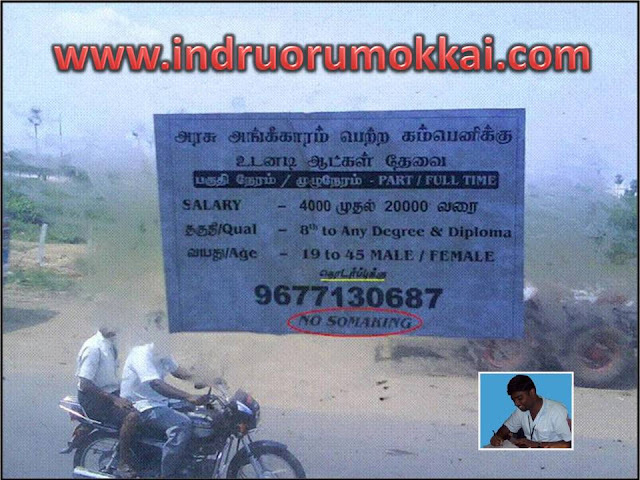 Namakke Thaanga Mudiyalai-la? There will not be anyone who is not aware of the favorite tourist spot Goa and we all may stayed at various hotels in Goa. We can get the details about Goa and various tourist spots in Goa in various sites including Wikipedia. 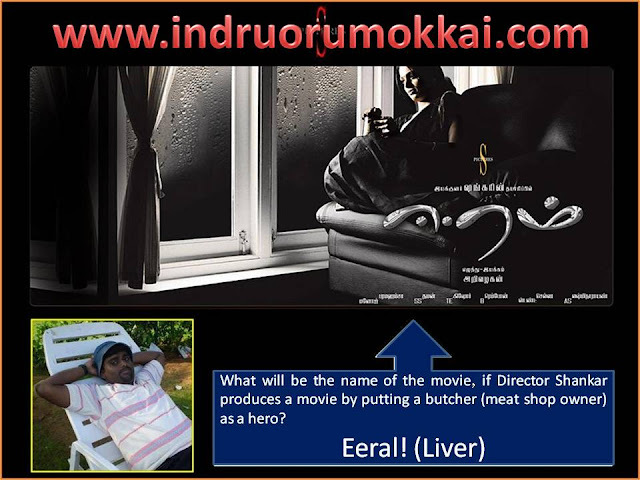 Another Goa that we know, is the movie produced in Sowndarya Rajnikanth and Venkat Prabhu combination.